/ Disney Monorail Hotels – Which Should You Avoid? 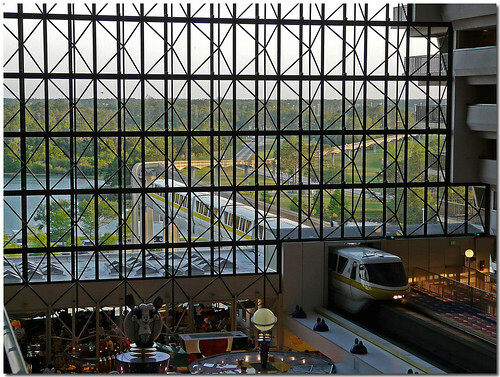 The Disney Monorail hotels are some of the most sought after on the Walt Disney World resort. 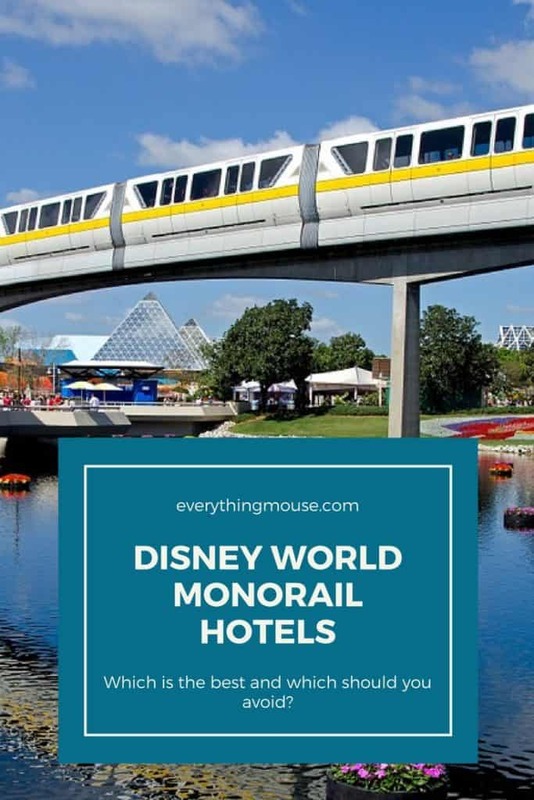 If you are looking for the perfect hotel resort location for your Walt Disney World vacation then you should take a look at the monorail hotels. The Disney World Monorail Hotels are among the most desirable and sought after of all the hotels on Disney property. However, we think that there is one which is seriously overrated considering the cost. Read our 2018 guide to find out which one of the Disney World Hotels on monorail we think just isn’t worth the cost. The Disney monorail hotels are all deluxe resorts which are located on the loop around the Seven Seas Lagoon. This monorail runs between the Magic Kingdom and the Transport and Ticket Center (TTC). This makes them the ideal location for visiting all of the Disney World parks. Not only can you walk out of your hotel room and step on the monorail to be transported to Disney’s Magic Kingdom but you also have very easy access to the other parks and resorts via the Transport and Ticket Center. You can also easily travel to Epcot on the monorail if you change lines at the TTC. There are no hotels located on the Epcot loop monorail. Disney’s Grand Floridian Resort and Spa, Disney Contemporary Resort and Disney’s Polynesian Resort are all Disney monorail hotel resorts. Each has a very different character so take a closer look at each before you decide which one is best for you. These hotels were all part of Walt Disney’s original vision for his new theme park. There are four Disney World monorail stops on the Magic Kingdom loop. The monorail has stations at the Transport and Ticket Center, Disney’s Grand Floridian Resort and Spa, Disney’s Contemporary Resort and Disney’s Polynesian Resort. The Disney World Grand Floridian is Disney’s premier hotel. This is the obvious choice for those looking for absolute luxury and elegance. On the surface it ,would seem to be a very ‘grown up’ hotel. However, this is Disney after all and families are made very welcome. You will feel just as at home in Mouse Ears and a Goofy shirt as you would in evening dress. 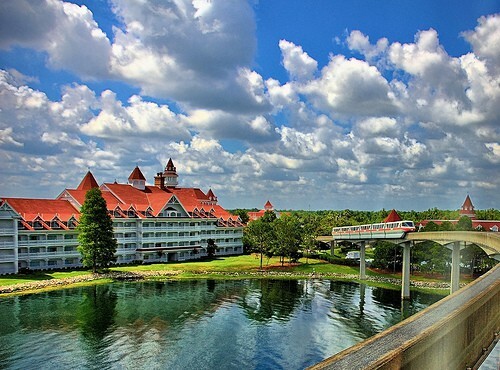 Disney’s Grand Floridian Resort and Spa has 867 rooms including 25 suites. The views from the rooms include Magic Kingdom views. The rooms are a generous 440 square feet and most have a balcony. The price that you pay will depend upon the room type and the view. Disney’s Grand Floridian has two excellent swimming pools, a beautiful sandy beach, a Wedding Pavilion, numerous restaurant choices, and of course all the convenience of being steps away from the monorail. Your journey from this Disney Monorail Hotel to Magic Kingdom is quick and easy. Without a doubt, the Grand Floridian is a beautiful hotel. Great rooms, beautiful grounds and excellent service and amenities. However, as we know, magic comes at a price. It is no surprise that the Grand Floridian Hotel resort has the highest rate of any Disney World hotel. What does the Grand Floridian cost? This is the most expensive of the Disney Monorail Resort Hotels. The rack rate in the cheapest Value Season starts at $646 for the Garden View rooms in the outer buildings. The same room at the Christmas Holidays in 2018 is $934 per night. The lowest rate for a Theme Park View Room at the Grand Floridian is $770. This rises to $1217 at Christmas. There can’t be many hotels in the world which have a monorail track running right through the lobby but Disney Contemporary Resort does! The Contemporary was one of the original Walt Disney World resort hotels. It has been extensively refurbished to offer modern, very comfortable rooms. The modern design is not to everyone’s taste and some may think it just not Disney enough. However, if you are looking for a high standard, exceptionally well located Disney hotel then you may want to give the Contemporary a closer look. Disney’s Contemporary Resort has two distinct sections. The main building with the monorail track running through it, the main lobby and the restaurants. This is the Tower building. The second, separate building is The Garden Wing. There are various view choices including the most popular – a Magic Kingdom View. The Contemporary is one of our favorite Disney Monorail Hotels. The only thing which really does need improving is the Contemporary hotel pool. It just isn’t up to par with the other Disney deluxe hotel resorts. The standard rooms at Disney’s Contemporary Resort are 394 square feet. Each room will sleep up to 5 guests and also accommodate a child under 3 in a crib. The resort also offers suites and concierge level rooms. There is plenty to keep you occupied in the resort. Disney’s Contemporary is home to a number of restaurants including the ever popular character buffer Chef Mickey’s and the fine dining favorite California Grill. There are two swimming pools at the Contemporary but they are probably the least themed and most disappointing of all the resorts at Disney. 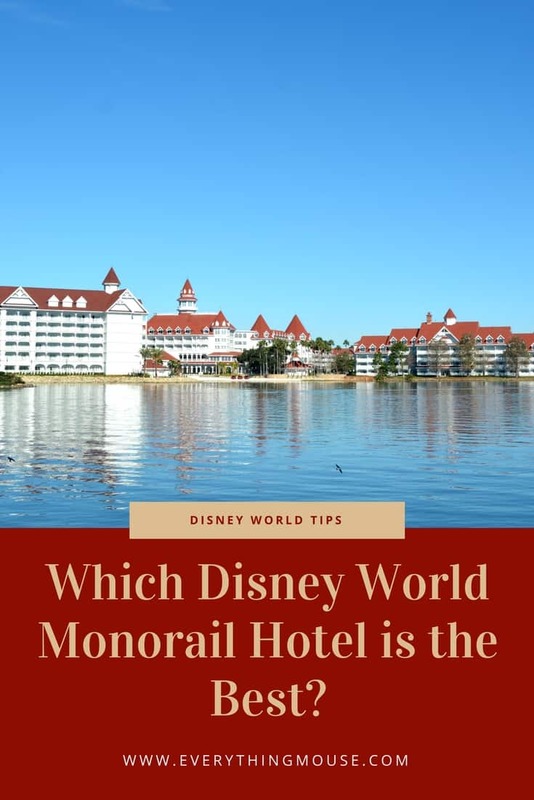 If this is an important aspect of your stay then you would probably do best to consider the Grand Floridian and Disney’s Polynesian which both have excellent pools. What does it cost to stay at Disney’s Contemporary Resort Hotel? The lowest rack rates for the Disney Contemporary Resort are $450 for a Garden Wing Standard View Room. Want to stay in the same room over the Holidays? You are looking at a rack rate of $708 per night. The lowest rate for a Contemporary Resort Bay Lake View? In Value Season the lowest rack rate is $741. Stay in the highest price Season and you will pay $867 for that room. The Polynesian Resort Disney World Florida is ideally located on the monorail system just minutes away from Magic Kingdom. Step into the lobby of Disney’s Polynesian Resort Hotel and you will be transported to a different world. This South Seas themed Disney resort has a lot to offer and is a great choice of Disney World monorail hotel. The rooms are large by Disney deluxe hotel standards. At between 410 to 476 square feet some of them are larger than Disney’s Grand Floridan hotel. Disney’s Polynesian Resort has been extensively refurbished. Prices vary according to room type and of course the view. Magic Kingdom and Lagoon views are the most popular and highest priced. There are 2 swimming pools at Disney’s Polynesian Resort. The most popular pool is the Nanea Volcano Pool complete with waterfalls and a slide. This is not a particularly large pool for the size of the resort and it does tend to get crowded at peak times. Guests can use the fitness facility at The Grand Floridian if they wish. Walt Disney World Polynesian Hotel also offers a good choice of restaurants – well worth a look even if you are not a guest of the hotel. It is home to the very popular dinner show Spirit of Aloha Polynesian Luau. All of the Disney Monorail hotels are excellent choices for a stay at the resort. The ease of traveling to Magic Kingdom really does make a huge difference as you can so quickly get to and from the park from your hotel. This is particularly important if you are traveling with young children and want to center your stay around visits to the Magic Kingdom. 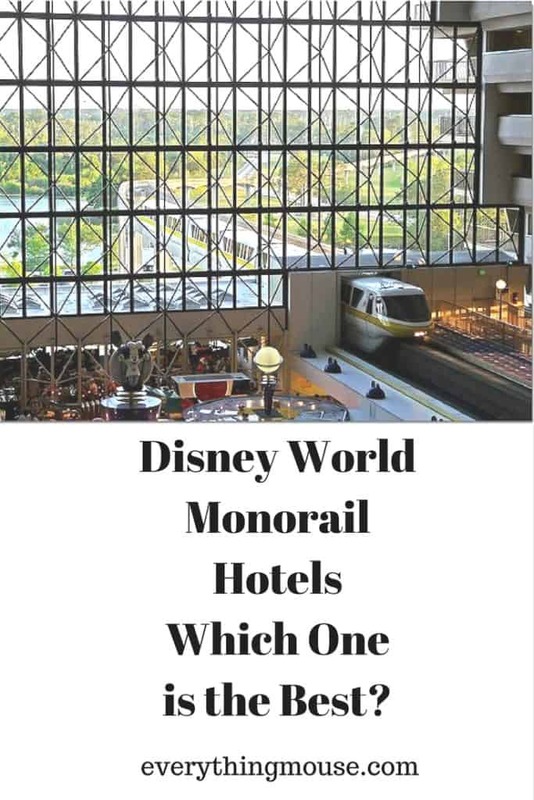 Each Disney monorail hotel has it’s own theme and it really is a question of personal choice as to which one would be the perfect destination for your Walt Disney World vacation. However, the Disney World Monorail hotel which is most definitely in last place on our list is the Grand Floridian Resort and Spa. Of all the Disney World Hotels on monorail t,his is the one which we would place last on our list. Whilst we know that this is Disney’s most expensive hotel resort we actually think that it is not worth the expense. If we were deciding between the Grand Floridian and the other monorail hotel resorts, the Floridian would definitely be last on our last. The location is not significantly better than the Contemporary Resort or the Polynesian. We just don’t think it is worth the premium price that you pay over the other two Disney monorail hotels.